As my dividend account is small my goal is to maximize income to get as much money out of my invested dollar as possible. Then the question comes, how to achieve it? I know I need to invest in companies providing higher yield to get more money in and reinvest them. I also understand that by investing into higher yield stocks I am taking bigger risk. A true dividend growth investor would prefer investing into lesser yielding stocks but he wants to have a maximum possible security as far as income from the dividends goes. Chasing yield can be dangerous, but there are stocks out there which offer security and high yield. There are stocks which are still acceptable such as some REITs (Realty Income O), MLPS (a former KMP now KMI), then stocks such AT&T (T), or now my favorite energy, oil involved stocks such as ConocoPhillips (COP) or Chevron (CVX). If investors are dumb enough to sell stocks which pay dividends, both provide great yield (CVX yields 3.90% and COP 4.50%) both have great dividend history and their decline is just temporary. Over the course of 5 or 10 years the stocks will be higher and paying a great dividend as they have been paying for the last 20 years. So, if you want to dump the stock, go ahead. I will gladly buy it. 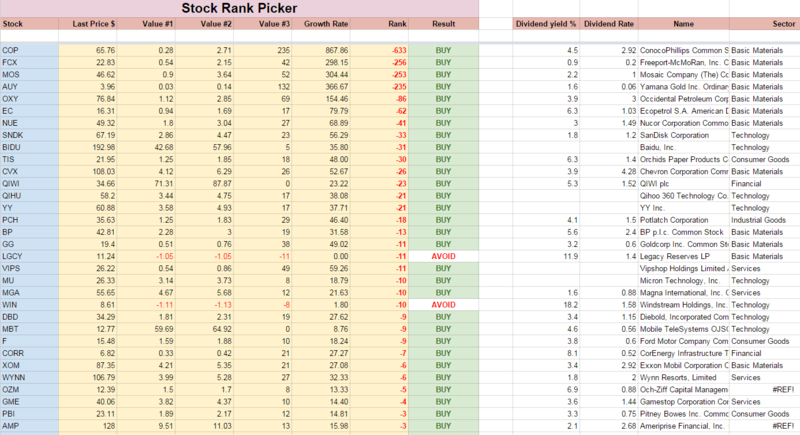 As you can see in the table above COP ranks as the most undervalued stock as the screener evaluated my entire watch list and calculated the rank for each stock. I decided to publish the result of the screener every month and invest into those stocks. How? I use two ways to invest into those stocks. My first way is to invest into those stocks by buying them all at once. How can you buy them all? It would be difficult to buy them all if you only have, let’s say. $20,000 dollars to start with. Fortunately, there is Motif investing (which by the way offers $150 promotion if you open an account, but the offer will end soon) which offers an opportunity to build a motif with your favorite stocks and invest in them all at once. You can invest as little as $250 and buy the entire motif (portfolio), and you can purchase partial shares of each company. It works exactly like investing into a mutual fund. The good thing here is, that you can create your own mutual fund and start investing. That’s what I did here, created a motif “Undervalued Stocks” and invested my own money in it. My second way, or strategy, is buying high ranking individual stocks from the screener. Every time, I have money available in my ROTH IRA account, I check the screener and buy the highest ranking stock with the highest yield. I recently invested into COP as it is high ranking, high yield stock. I am saving more cash for my next purchase and I was thinking what would be my next purchase? Should I invest again into COP or should I pick the next high yielding and high ranking stock? 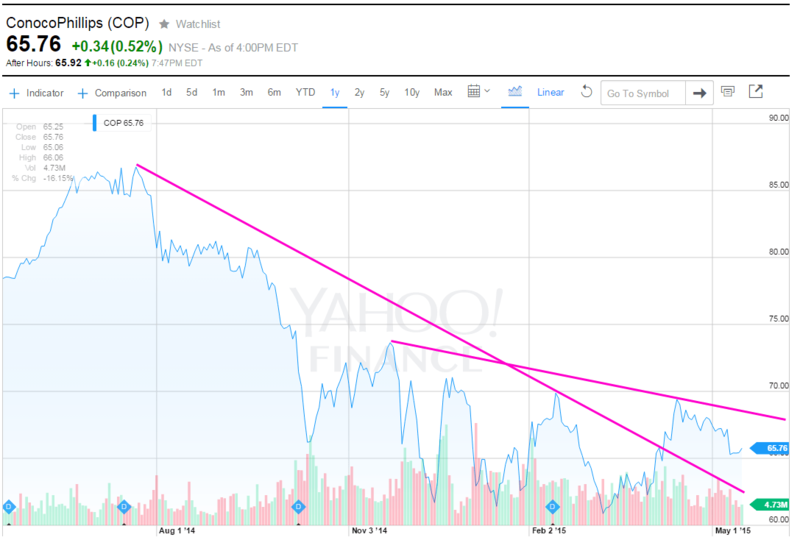 Then I saw CVX and what caught my eye was its dividend rate. I noticed CVX is paying $4.28 a share, while COP just $2.92 a share. Wow, that’s almost twice as much as COP! And I want my portfolio to grow faster so investing into CVX would pay me more money, right? Well, it depends. Sometimes just looking at the numbers only without putting them into perspective can be deceiving. I was completely decided to make my next purchase into CVX because of the higher rate I can get. But then I used a simple math. If I invest $1,000 dollars (as is my minimum limit) I would be able to buy 15 shares of COP (at current price of $65.76), but only 9 shares of CVX (at $108.03 a share). COP then would pay me $43.8 annual dividend, but CVX only $38.52 annual dividend. I get more money investing into COP with a lower rate for invested dollar. That means, that I will continue investing into COP as long as it stays in my screener as “BUY”. Well, this small exercise may seem obvious, but the point is that the numbers can be misleading and before investing, always look at them from a different perspective. Don’t invest into any stock just because one number looks better than the other one. It actually may not be. What do you think? 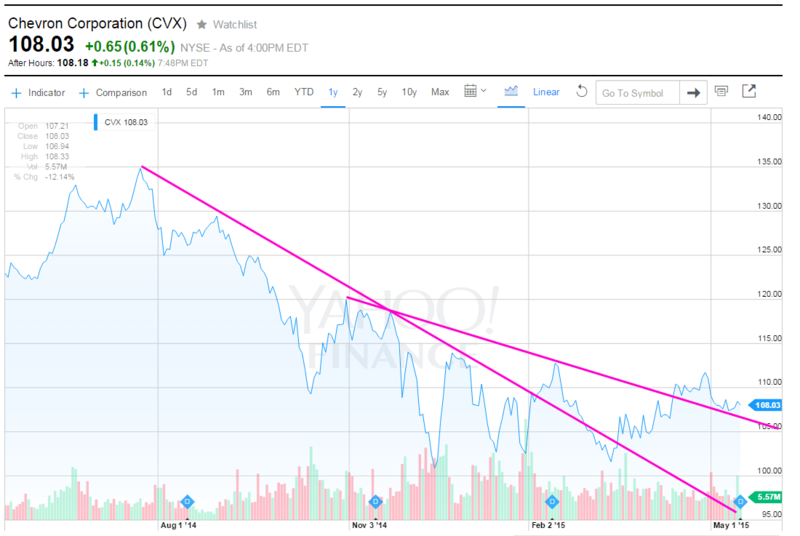 Would you invest into COP or CVX? COP and CVX are both solid oil companies. Yield and dividend growth are two factors for me. I’ll continue to accumulate shares upon dip as long as my cash allows me. Hi MU, I also look at yield and growth. I use all metrics, but this time I was thinking which of the two would provide me with a bigger payout on invested dollar. So yield is what matters. Obviously. Definitely dividend yield (plus growth) for me. As you show, the rate is dependent on how much the shares are worth. A $2/share rate tells you nothing until you know the cost of each share. Out of curiosity, do you elaborate on what data goes into your formula? I just wonder why one of the other oil majors, BP, fell so far down the list. I use a few metrics, some are based on past and statistically projected future performance of the stock, then the results are compared to current pricing, calculated growth rate and what the pricing should look like. The bigger the difference between the two the more it is likely that the stock will want to eliminate that valuation difference. So it works like a rubber band. If the stock goes low too much it will have a tendency to return back to normal, but while returning to normal it will over-swing to the other side like a pendulum. Of course the projection plays its role in it too. If the company reported worse results than before it may change the projection and lower the growth rate and then lower the internal value of the stock, then the rank goes lower. On the other hand if the stock price goes higher, then the difference is closing and it goes down the list too. So far I had stocks making 15 or more percent since they appeared in the list. Some made it within a few days or weeks, some are still hanging there waiting for the run up. Will see. I am still testing it and see how that works. However, I use this screener to scan my watch list only, which is almost entirely compiled from dividend stocks, so I feel comfortable with it.